And so she found herself thinking about mercy and reading about it and talking about it and writing about it. 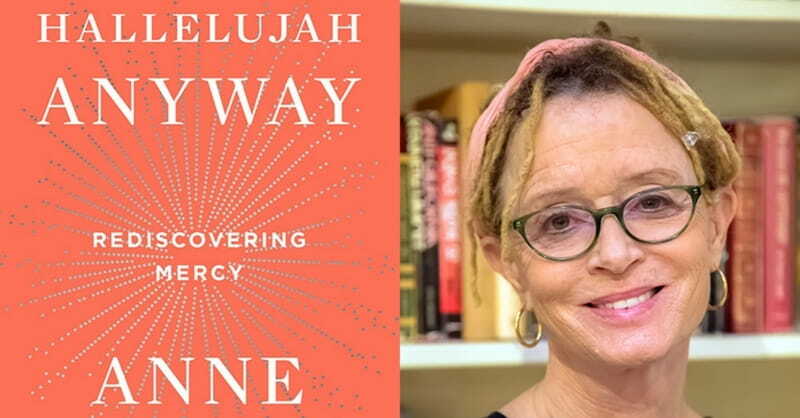 And then, she said, she “accidentally” found herself writing a book about it — “Hallelujah Anyway: Rediscovering Mercy,” published this week by Riverhead Books. Lamott talked to RNS about her new book and how to offer mercy in the middle of the Twitter fight and in a politically divided country. This interview has been edited for length and clarity. How do you define mercy? To me, it’s sort of like grace in action. It’s grace as that unmerited, beautiful energy of assistance and second winds and buoyancy and fresh air and help to our feet. That’s how I define grace, and mercy seems more like the action of that. It’s the miracle that we’re forgiven, the miracle that we forgive even the most impossible people, including relatives, the miracle that we have found mercy in our hearts for people who have hurt our children. I think probably synonyms are compassion and lovingkindness in the Buddhist tradition and forgiveness almost. (It’s) the tenderheartedness of my relationship with God, the extreme forgiveness of God and, of course, the wonderfully low standards of God so that even someone like me is completely adored and welcomed in the great shalom of God wanting us. So mercy is all of those things. To have a merciful heart means your heart has been softened by the meat tenderizer of grace so that even if somebody is wrong or has wronged you, you feel mercifully toward them. You get it. You get that they have suffered. You get what an effort it is for them just to get through the day. You’re transparent about your politics and your disapproval of the current administration. What do you think is the role of mercy at a time when our country is so divided politically? I just think mercy is our only hope. Arlie Russell Hochschild wrote a beautiful book called “Strangers in Their Own Land,” and it’s about all these years she spent recently with the Tea Party movement in the bayou in Louisiana, just getting to know people and really just getting to listen, eating with them and going to church with them and going to work with them and staying home with them. I started foisting it on everyone after the election. For those of us who are, say, troubled by Trump, because it’s a very dark, scary time for those of us who are passionate about care for the elderly and the poor and the disabled and the environment, this book brings so much light in terms of reminding us most miracles, I would say, really begin with people listening to each other instead of judgment and arms crossed. I try to make the case that anything but mercy and forgiveness just hurts you. It just keeps hurting you and keeping you clenched and defensive. This other thing leads to communion and community and a softening of these scared hearts. You mentioned being plugged into the internet. You write in the book about a particular tweet you posted that your son had urged you to apologize for. I wrote this thing just spur of the moment. While cleaning out a drawer, I found a note scribbled on a napkin. I’m old. I’ll be 63 next month. When I grew up, there was only paper and pencils and typewriters. And so what I said without thinking was, “Carry a pen. Write on paper as much as you can,” and I had as savage an attack just about as I did with the Caitlyn Jenner thing. I made a mistake, but the savagery of the response – if you read the Twitter responses to my thing, it’s crazy. I don’t actually respond to Twitters I hate. I also don’t go places where I know the person’s theology or political positions are going to drive me crazy. There seems to be a thirst to be made crazy. Sometimes I’ll get into it with my family or with something more local, and it’s really a hit. It’s like cocaine or an espresso. Anger is very mood-altering, and self-righteousness is very mood-altering, and I can say that absolutely from my own experience. I love to block people who are rude and awful, and I’m sure Jesus would be blocking everybody like crazy too if he was around. So how can we better extend mercy to each other on social media? I got clean and sober 30 years ago, and one of the first things I heard was, “If you’ve got a problem, go look in the mirror.” First of all, I’m probably the only aspect of the problem I can change, and it’s almost certainly a spiritual solution, and it probably has all or something to do with the problem. I have to look at why I want to feel angry, why I want to continue something that is so stupid. I’ve always said in probably every book I’ve written, you take the action and then the insight follows. You don’t have to break some sort of mercy code, or you don’t have to break some sort of “how to live morally” code, you have to take merciful actions. If you want to have loving feelings, you have to do loving things, period. Photo: “Hallelujah Anyway: Rediscovering Mercy” by Anne Lamott.